All right, Ozzie, just what the heck is so funny? A) "Look at Coach Herzog's tummy!" 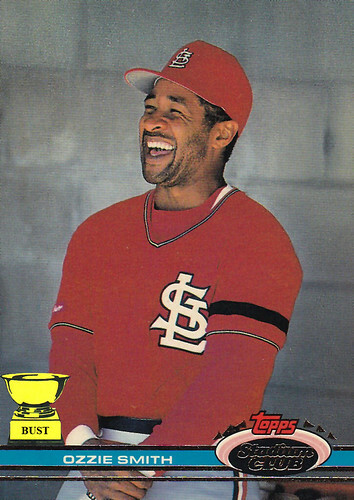 B) "Willie McGee is making funny faces again." C) "Remember those old Padres uniforms? How can you not laugh at them?" D) "Nothing. I'm just having heat stroke from all the shirts I'm wearing!" E) "That kid Cole looks just like Urkel. What a cut-up!" F) "I'm drunk as hell!" G) None of the above. Definitely none of the above.